Mr Gasket Thermocap Radiator Cap - Dezod Motorsports Inc - Home of the automotive performance enthusiast since 2002. Mr Gasket Thermocap Radiator Caps fit most domestic and import vehicles. 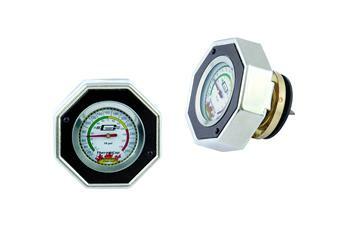 Built in calibrated thermometer and integrated coolant reclamation valve give owners vital “at a glance” information.